It is easy to embed YouTube video in your website or blog. The YouTube video will automatically play when loaded but with sound muted or no sound. You just have to paste the code in the place where you want and can customize the variety of options provided by YouTube, including not only sound muted YouTube video but also skip full-screen option, dimensions and other layout behavior. 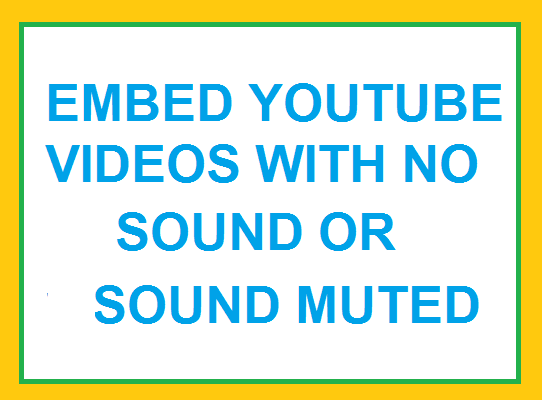 Normally when an embedded YouTube video loaded, the video will usually autoplay with sound, although the user can mute and unmute manually but this tutorial will guide you to use the option to automatically load the YouTube video with the sound muted. The following tutorial will guide you to embed YouTube video that will load automatically. Copy all code and paste it in the place of your website or blog where you want. That’s all now you can enjoy the embedded YouTube video with no sound. You can customize the above code by your will, hope so you have learned to embed Youtube video with the sound muted, do comments with your feedback. Thanks its my pleasure that you have liked the post.